The new Corolla’s lower roof, wider front and rear track and lower center of gravity provide a more athletic stance, Toyota says. Toyota takes its leadership in hybrids to a new level with the gasoline-electric Corolla. The compact car will be the first model from Toyota to offer two different hybrid variants. One will be a high-performance version. The aim is for the Corolla to match the success of the RAV4, for which 80 percent of all sales are hybrids. As with the RAV4, Toyota will not offer a diesel version of the Corolla. 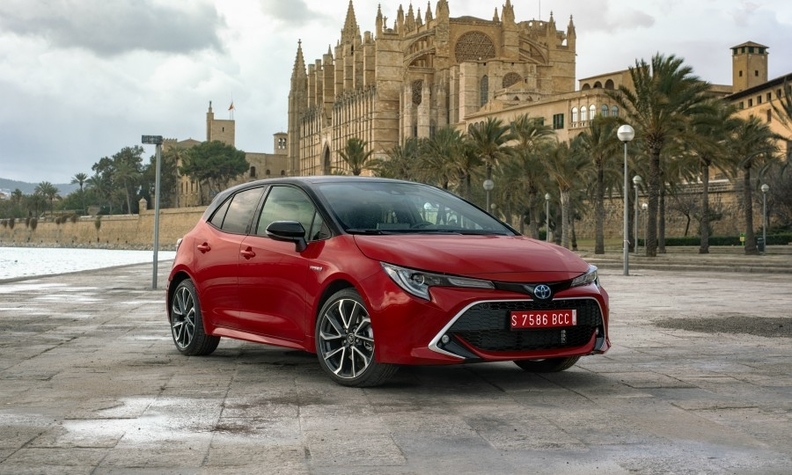 Toyota previously sold the hatchback and wagon versions of the car as the Auris in Europe. liter gasoline engine along with fuel consumption of 3.7 liters per 100 kilometers. This system is not available in the Corolla sedan. All three variants, however, offer Toyota's 1.8-liter, 122-hp hybrid drivetrain, which has fuel consumption of 3.3 liters per 100 km. This powertrain is also offered in the Toyota Prius. In Europe, Toyota will have a limited range of non-hybrid powertrains, with the hatchback and sedan only offering a 114-hp, 1.2-liter four-cylinder gasoline engine, which replaces the 1.3-liter option. The sedan's only non-hybrid variant is a 132-hp, 1.6-liter gasoline unit. The starting price for the non-hybrid Corolla in Germany is 20,990 euros while the base hybrid is 27,290 euros. In terms of the Corolla's design, Toyota is betting on a more aggressive front end as well as expanded outer dimensions. The length has grown 40mm to 4370mm, but its stance is wider. In addition, the car's wheelbase is 2640mm, matching the Volkswagen Golf (2630mm). Technology: The Corolla can pass vehicles autonomously, hold the lane on its own and read traffic signs, including stop signs, the beginning and end of highways, municipal and residential areas, and the end of any road restrictions. The Corolla also has the most recent version of Toyota's standard Safety Sense system, which recognizes vehicles ahead at speeds up to 180 kph, as well as cyclists during the daytime and pedestrians in the dark. Visibility: Toyota made seeing out of the Corolla easier for the driver by using thinner A-pillars and lowering the dashboard and the hood. Expanding lineup: The Corolla is the fourth model to be built on the Japanese automaker's Toyota New Global Architecture (TNGA). The others are the Prius, C-HR and RAV4. Huge output: Toyota has sold 46 million Corollas over the last 53 years. This is the 12th generation.